From a care insert that was placed in boxes of Chuck Taylors when they were sold in a red and white box. Converse All Stars are described as Eleven Ways Better! 1. Each shoe is lightweight for speed. 2. Each shoe is made with a Foot Form Last for fit, comfort, and support. 3. Each shoe is made with a shock absorbing full length sponge insole and arch cushion. 4. The “Peg-top” upper on the high top shoe gives extra support without binding the ankle. The oxford features the new angle-cut high front quarter design for snug instep support. 5. Shoes have loose lined and ventilated army duck uppers for cool comfort. 6. Shoe uppers feature an under-stitched web tape backstay for extra strength. 7. Shoe front has a rugged protective toe guard. 8. Shoes have permanent-set eyelets for easy lacing. 9. Shoes are made with double sole binding for flexible strength. 10. Shoes have a non-marking positive traction outsole. 11. Shoe sides contain ventilating eyelets . . . for cool comfort. Wear good quality socks. They will absorb perspiration, thus prolonging the life of your All Stars. Good socks also help keep your feet in proper condition. Loosen laces all the way down after wearing. Open shoes and store in a well ventilated place at normal temperature. Products containing petroleum will deteriorate rubber and should not come in contact with the shoe. Do not use a bleach or any washing compound containing a bleaching agent as it will decrease the tensile strength of the fabric. It is perfectly safe to use a mild soap and water solution to wash out dirt and at the same time reduce the effect of perspiration absorption. Do not put the shoes in a washing machine. This is not recommended by the Converse company because the process will dilute the color of the canvas, especially bright and dark colors. Hand cleaning with a damp cloth is the preferred method. After washing with water, the shoes should be dried at normal temperature away from excessive heat such as stoves or steam pipes. Do not dry shoes in automatic dryers. A new cleaner, Star Cleaner, is recommended to clean and restore the toecaps and foxing on pairs of chucks. For more information see the article about this. You can also use black shoe polish on monochrome black models. A wet sponge or cleaning cloth with a little soap if desired can quickly clean up dirt or minor spills on your toe caps or rubber foxing on the sides of your shoes. If you want your shoes to look “new” as long as possible, clean the toecaps and rubber sides after each wearing. When lacing your All Stars, take the time to straighten out the laces so they are not twisted. They will last a lot longer, look better, and stay more securely tied. When lacing your All Stars, adjust the tongue so that it is centered under both rows of eyelets. Your fit will be a lot more comfortable. If you have trouble lacing up through the top eyelets, it could be that your laces haven't been tightened on the bottom eyelets. Remember to stretch your shoelaces as you lace them up for the first time or two. 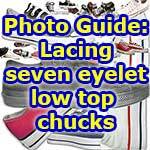 Shoes with seven pairs of eyelets should have 45 inch long laces, shoes with eight pairs of eyelets should have 54 inch laces, and shoes with nine pairs of eyelets should have 63 inch long laces. These are the suggested lengths by shoelace manufacturers. 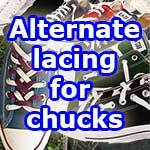 Most pairs of chucks come with shoelaces that are much longer than necessary. If you don't want to deal with the extra long laces, it is a simple matter to replace them with the correct length. You can purchase classic flat tubular laces through this website in as a wide variety of colors and styles as well as narrow, fat, extra fat, print, and reversible laces. Click here to see a complete article about current shoelace types, color selection, different lacing styles, and tips if you have problems with the way your shoes lace. The “perfect” pair of All Stars (a perfect 10) would be two shoes that are mirror images of each other. The toecaps would be the same size, not too big, not too small, the first set of eyelets would be the same distance from the toecap, approximately 1 to 1 1/4 inches from the toecap. The textured white rubber toe guards around the front part of the shoe should extend the same length on each side or slightly more toward the inside of the foot. The inside “portholes” should be centered and uniform in spacing. The colored racing stripe around the shoe should be uniform and not too thick. The round ankle patches should have the word “CONVERSE” centered at the top and over the ankle. The standard ankle patch is white with red lettering for the words “CONVERSE ALL STAR” and the star and the Chuck Taylor signature in bright blue. The rectangular heel patches (ALL STAR) should be at the center of the back of each shoe. The tongues should protrude one half inch above the top eyelet. “Seconds” would be those pairs that have different size toecaps, uneven spacing between the toecap and first set of eyelets, uneven eyelets or improperly positioned ankle patches. 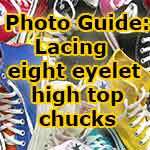 Want more information about chucks? Planning to write an article or term paper about chucks? Click on the Books, About Chucks, or Articles link below or check out How To Write A Term Paper About Chucks.